This growth and reliance on telecommunication systems mean that temporary towers are needed during natural disasters and periods of high-volume communications, such as football games or trade shows. When you pair this with the wealth of modern technological innovations that have been made, and you’ll start to see why it’s more important than ever to select the appropriate rigging and industrial pulley systems for permanent and temporary tower applications. 1. What Type of Rope Should I Use For My Towers? Rope for rigging primarily falls into two categories: fiber rope and steel wire rope. Braided or stranded steel guy cables are generally utilized to anchor guy towers to the ground and have long been the preference in rigging due to their resistance to abrasion, high temperatures, and ultraviolet light. However, lighter synthetic fiber ropes come in an expansive variety that can be better suited to the specific needs of telecom equipment. 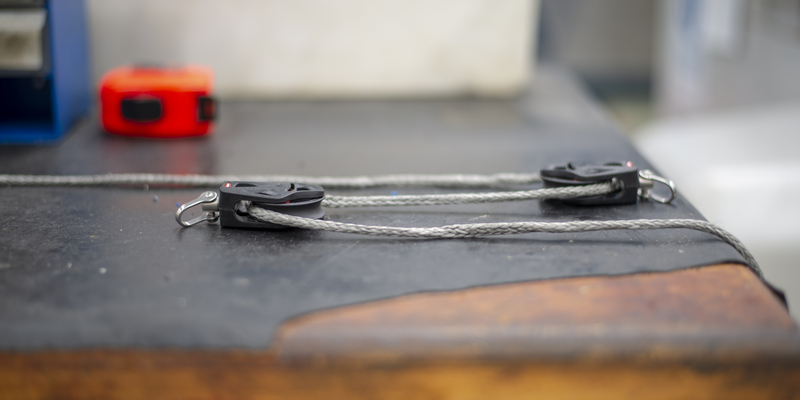 Especially in temporary tower systems, these lighter and longer-lasting synthetic ropes stand up to continuous reuse better than steel ropes do. For example, when working with a Cell-On-Wheels (COW)—defined as a portable mobile cellular site that provides temporary network and wireless coverage to locations where cellular coverage is minimal or compromised—you’re going to want a higher rope product that’s easier to handle and deploy. This is exactly what industrial-strength fiber ropes from Dyneema® can provide. These ropes often used as alternatives to traditional steel cable thanks to their superior strength to weight ratio, longer lifespans, and safer handling compared to steel ropes. Synthetic ropes also store less kinetic energy under tension than steel. 2. What loads will my pulleys need to carry? You’ll want to invest in load-tested equipment with an anticipated working load that is one-fifth the maximum load rated for the pulley. Load rated products—like those that are strenuously tested at Ronstan—are reliable, safe, and often critical for meeting codes in the telecom industry. Ball bearing blocks can help decrease friction, and as a result, maximize the efficiency of load-bearing performance when compared to pulleys with traditional bushings. However, a larger diameter sheave on a bushing pulley can also increase local mechanical advantages and accomplish friction reduction on the axle that’s comparable to the reductions a midsize bearing pulley can provide. For high load performance, you may prefer a light-but-strong aluminum sheave with an Oilite® (oil impregnated sintered bronze) bearing. For small temporary tower pulleys, the Series 75 we offer here at Ronstan has sheaves in both stabilized acetal (a plastic ideal for fiber rope) and a higher grade anodized aluminum alloy (suitable for wire). You can also consider multi-pulley block and tackle combinations that reduce the load on individual pulleys and increase mechanical advantage when strength is more important than speed. We offer gun, luff, double, gyn, and threefold purchase tackles with advantages of two to six, respectively. 3. How Frequently Will My Pulleys Be Mechanically Stressed? Friction creates heat and abrasion, which can degrade your pulleys over time. Frequent deployment of small, lean, and temporary telecom tower equipment may encourage lighter duty pulleys systems in materials like nylon, but the specific materials must be selected for their ability to stand up to continuous forces. The rope you selected can also influence the style and material of sheave most suitable for frequent deployment. Nylatron® sheaves, for example, have significant resistance to wear-and-tear, can self-lubricate, and exhibit low friction properties. This makes them a cost-effective plastic choice that works well with steel wire. On the other hand, synthetic ropes are often ideal for being deployed and redeployed repeatedly. 4. What Pulleys San Safely Tolerate My Tower’s Environment? Outdoor systems will need pulleys with greater tolerance for wind and weather compared to indoor systems. Extreme temperatures and moisture require robust equipment that will not degrade or risk failure. Stainless steel, for example, tends to be popular in blocks for its strength, durability, and minimal maintenance even in salt air and precipitation. With many years in the marine and tensile architectural industries, Ronstan products are battle-tested to withstand mass deployment in the harshest environments. The best way to decide upon your pulley systems for your telecommunications towers is to ask these four questions and consult with us today!